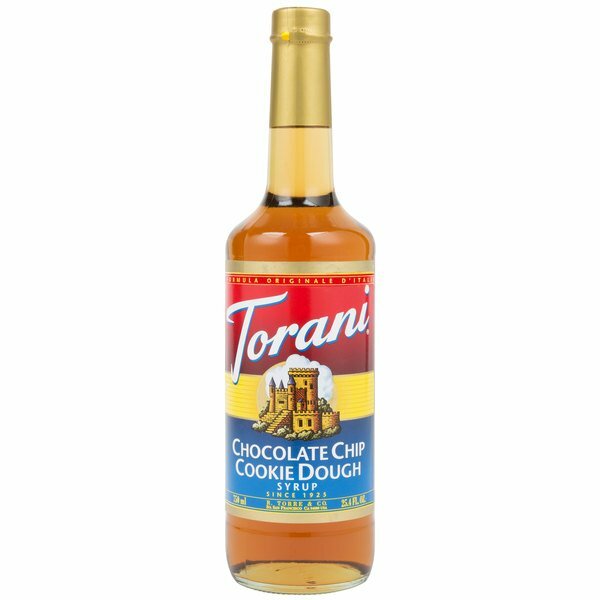 Bring all new flavors to your specialty drink menu with this Torani chocolate chip cookie dough flavoring syrup! This tempting flavor will complement your beverages without overpowering them or being too sweet, while the user-friendly bottle will be convenient for your busy baristas to use. Torani flavoring syrups are specially formulated to resist curdling in milk and to hold up well under heat, making them the perfect choice for espresso-based drinks, brewed coffee or tea, and more. Use this flavor for frappes, iced coffees, smoothies, and even baking! Let your patrons indulge their craving for sweet cookie dough with this chocolate chip cookie dough dessert flavoring syrup! Drizzle it atop cakes, or even bake it into pastries for a creamy taste with a hint of chocolate chips. Discover new Torani recipes for this flavoring syrup, including chocolate chip frosting, cookie dough latte, cookie dough steamer, and mint chocolate chip cookies! This syrup flavor is perfect all by itself, or paired with other flavorings like cheesecake or chocolate sauces for the perfect latte every single time! We use this for our cookie dough lattes. Good unique flavor when used just right. Too much though and you can have a little bit of the chemical taste. We're always looking for new drink flavors. I was very skeptical at first, but this has quickly become one of our top selling latte flavors. Now of course you should always be weary of the confectionery and/or chocolate flavors when it comes to these syrups, they're REALLY hit or miss. But this one oddly defied expectations in a strange way for me. I'm gonna give it to you straight: Remember enjoying cookie crisp cereal as a kid and savoring the sweet, chocolate-chip-cookie cereal-infused milk when you were finished? This makes a latte taste SHOCKINGLY just like cookie-crisp milk. It's sugary, but for once it's actually alright for it to be a bit sweet than you'd expect. Surprisingly good despite not being quite what I expected, and it doesn't hurt that it makes a nice, almost nostalgic latte. Give it a try, it's better than the cookie-butter or tiramisu flavors. Is there anyone doesn’t like Chocolate Chip Cookie Dough? When I put it on the shelf, it goes in a few days empty. People love it. Soooo good! Was a little skeptical but it made a really nice iced coffee for a customer. Added some almond milk and so tasty. Tastes like dessert! Great taste. Amazing smoothness. I use it to flavor my water and coffee and it is amazingly light and robust at the same time. Great product for ice cream as well. Very glad I purchased this flavor. We use this Torani Chocolate Chip Cookie Dough Flavoring Syrup very often at my cafe and it adds the perfect touch to our coffee! I would definitely recommend this product. WebstaurantStore always has fast shipping and is consistently reliable! This is a delicious syrup that we use in our business. Customers and staff live this flavor and especially this brand. Will buy again soon! Got these for making Italian Sodas in our store. Love them and they work awesome. Love the different flavors offered and the price point on them! We love using the Chocolate Chip Cookie Dough Torani syrup to make our cookie dough ice cream. The flavor is delicious and flavorful. Our customers say it taste just like the original cookie dough ice cream from a store! This is so popular with the young adults getting ice coffee and lattes. We drizzle a little chocolate and some chocolate chips with it to take this great syrup to the next level. This syrup is a great milkshake flavoring! It turns ordinary vanilla iced cream into a gourmet delicacy sucked through a straw! 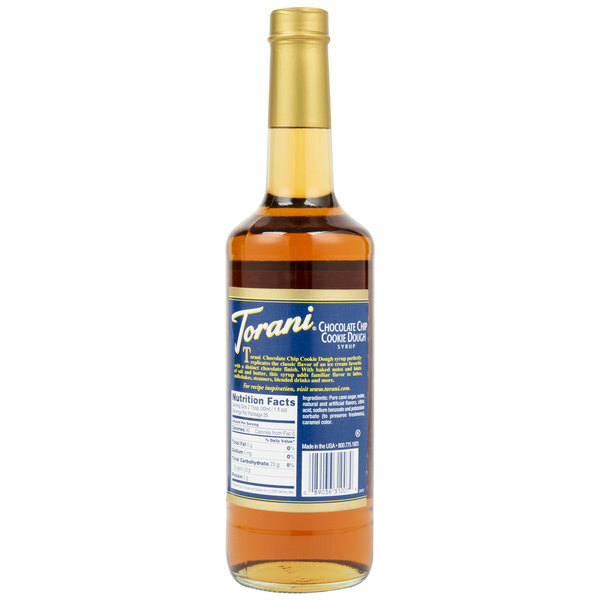 Torani is one of my favorite brands of syrups, they are always a good quality and a true flavor. Not a big fan of this one. It’s very sweet and doesn’t really taste like Cookie dough, and hardly any chocolate flavor. This one isn’t very popular with customers. Chocolate chip cookie dough froyo is one of our best sellers! We love using torani brand Chocolate chip cookie dough to make it because of its strong flavor! We love that our customers love topping it with cookie dough bites we order from webstaurant to make it the perfect cup as well! The great toriani flavor you are looking for, and a good price. I use this choclatechip cookie dough on a coofe bare for brunch, its a great addition. This flavor is one of my best sellers. For hot coffee it needs little to give a full rich buttery flavor. Try a cold coffee with drizzle....wow. Hands down my favorite flavoring... I'm truly obsessed. I drink it in coffee, Cappucinnos, hot chocolate and I'm about to start experimenting with baking with it for cupcakes and/or frosting. One pump in my hot drinks is all I need... It truly does taste like chocolate chip cookie dough. Yum!